Bastrop is set among the “Lost Pines,” a unique pine-oak forest just east of Austin. 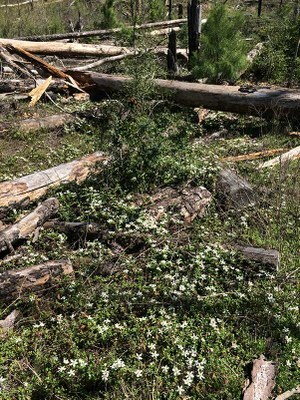 Over 75,000 acres of loblolly pines, known as the Lost Pines ecosystem, lie scattered across sections of five counties on the Texas Coastal Plain. 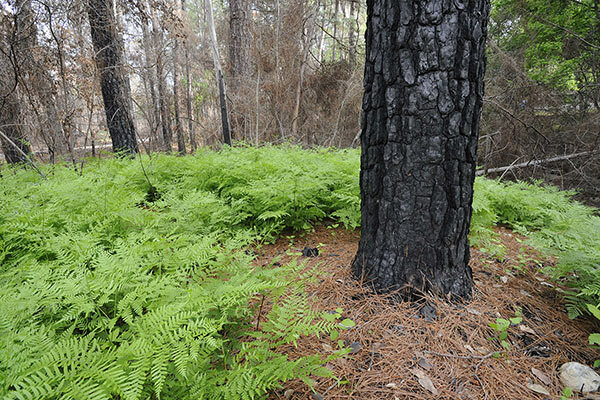 Bastrop and Buescher state parks protect a portion of this pine forest. The Lost Pines are the westernmost stand of loblolly pine trees in the United States. This loblolly pine woodland is isolated from the main body of East Texas pines by about 100 miles of rolling, post oak woodlands. Pollen records indicate that pines have grown in this area for over 18,000 years. Sandy and gravely soils with a subsurface layer of water-preserving clay help to create an environment where loblolly pines can flourish. Over time the climate here became drier, but the local sandy, aquifer-laced soils allowed the trees to thrive. These pines have become genetically unique. They have adapted to 30 percent less rainfall than loblollies from East Texas and adjacent states. Wildfire damaged 96 percent of the park in 2011. Learn more on the Wildfire & Flood Damage page. 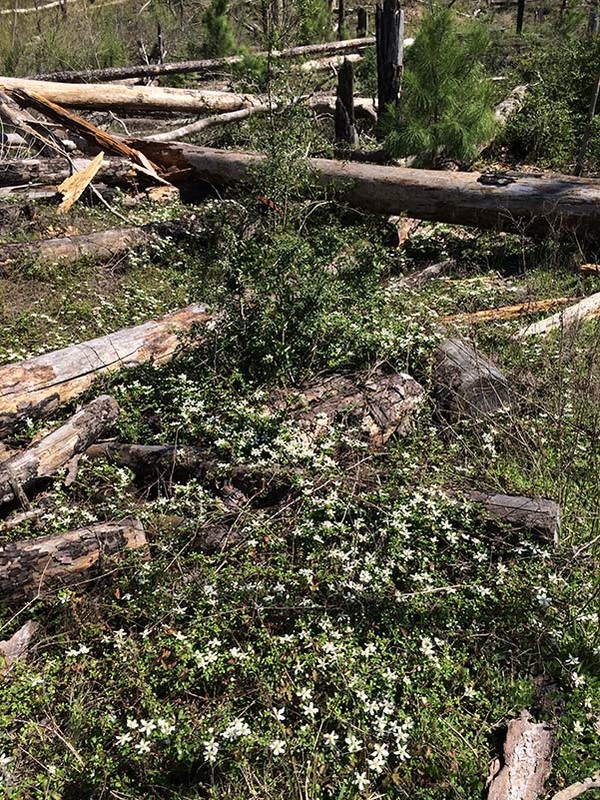 Dewberries thrive amongst burned tree trunks. The parks lie in the ecological region known as the Post Oak Savannah. A mosaic of pines, oaks, shrubs, grass­land and mixed flowering plants create an environment im­por­tant to many species of wildlife. This includes the pileated wood­pecker, the largest of the woodpeckers. Many other species such as white-tailed deer, rabbits, squirrels, opossums and armadillos live here. Ask at headquarters for a checklist of the birds of Bastrop and Buescher state parks. 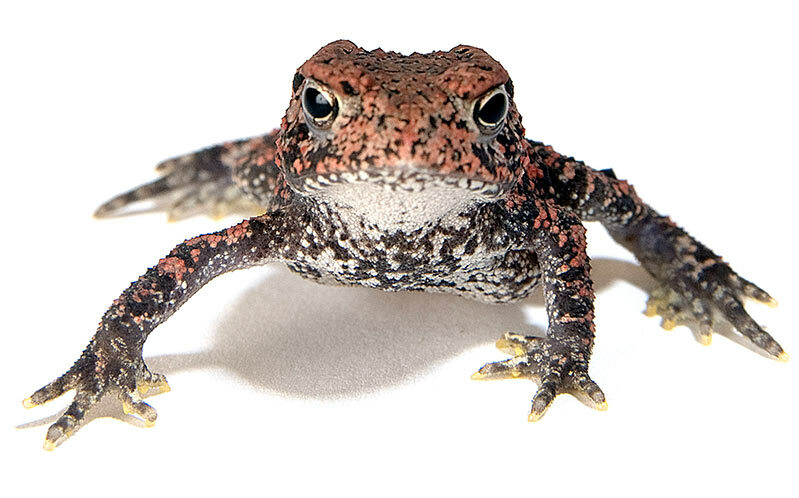 Houston toad: The seasonally moist, sandy soils of the Lost Pines provide critical habitat for the endangered Houston toad. Loss of habitat in its historic range led to a marked decline in numbers of the toad in recent decades.